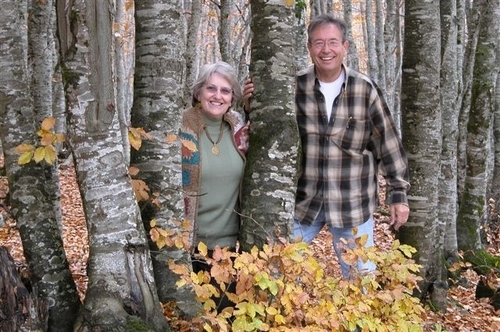 Carole writes, "Ken and I went out for a countryside drive this morning to see some Fall colors. They were so beautiful, but for the earlier morning we didn't realize the camera lens was foggy and so many of the various colors looked like they were filtered. But these are some we liked. The ones of us together were taken by Ken sitting the camera on the car, then RUNNING to get in the picture. Thus a bit of laughter on his part as he tried to look relaxed. "